The easiest place to start is the processor, the brain of the computer. The processor does all of the “thinking” – all of the calculations from the Calculator app to how fast to move the mouse pointer across the screen go through the processor. So, the more that your processor can handle, the better your computer performance will be. But how can you tell which is better? The easiest place to look is the clock speed. Most processors sold today range between 2.0GHz (gigahertz) and 3.0GHz. These numbers represent how many billions of instructions a processor goes through every second. Obviously, the higher number is the faster processor, and will yield the best performance. But does that mean that all 3GHz processors are better than all 2GHz processors? Not always. Without going into everything and without going into too great of detail, the basic parts of a processor to be concerned with are the core, the front side bus, and the cache. The core is the part that does the main thinking and calculations. What to look for in a core is how many of them there are, and any special features built into it. Chip manufacturers hit a wall a few years ago on how high they could get a CPU’s clock speed to go, so they looked at other methods of improving performance – and one way they found was to use multiple cores. It’s like having an extra processor built into the chip. A dual-core processor that runs at 2.0GHz will get just as many instructions done as a single-core processor running at 4.0GHz – but that doesn’t mean everything will run twice as fast. Most applications can’t take advantage of multiple cores, but having them will spread the load out so that the processor can do more things at once (like downloading a file and playing a game at the same time). 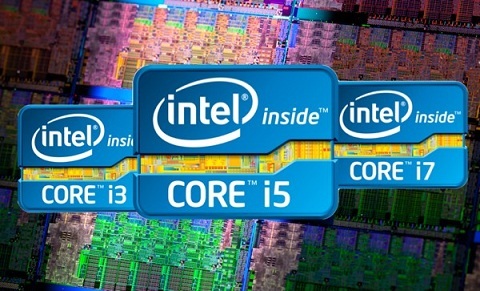 For example, the new Intel i3 processors are dual-core, while the i5 and i7 are quad-core. Features of the core can be something as specific as a particular instruction set (which won’t matter to most consumers), built-in graphics capabilities (such as the new Sandy Bridge core processors), Boost (and Intel technology that increases the core’s clock speed), or hyper threading. Hyper threading allows a core to do two sets of instructions at once, effectively doubling the number of cores a processor has. However, again, unless an application is specifically built for it, this will only help with multitasking and will not grant a direct performance gain. The front side bus is how fast the processor can talk to the rest of the computer. The faster it can get data in and out, the more it can do for the computer. Faster clock speeds (measured in megahertz, MHz) are better. However, this number has to match what the motherboard and the RAM are capable of in order to do you much good. If a processor’s front side bus runs at 800MHz, but the motherboard and RAM only clock in at 600MHz, then the processor can talk to the rest of system at only 600MHz, or 600 million cycles per second. The cache is how much data the processor can store and work on without having to access the RAM through the front side bus. More is better, usually measured in MB (megabytes). K is more aimed at gamers who want to overclock the processor (forcing it to run at a higher clock speed at the risk of damaging the chip). S designates a general performance line, and T is for an electricity-saving model (useful for laptops, for example). For the average user, you’ll want to aim for a mid-range processor. If you know that all you will do is surf the web and read email, then you can even go for a bargain-bin range processor without noticing a real deficiency. Don’t pay extra for a “K” chip unless you know what it means and plan to do some heavy gaming and/or overclocking.